There is simply no other seat on the market today that wows us like the Toto Washlet S350e. It is an incredible toilet seat. For starters, it has an automatic open and close lid that works by sensors. As you approach the toilet, it will detect your movement and open the lid. You can even set the seat to lift automatically. Or you can use the button on the remote to lift the seat. When you’re done using the toilet, the lid and seat will close automatically. Another cool advanced feature with the S350e is the night light. We really like it because you don’t have to turn on a bright bathroom light when you go to use the toilet in the middle of the night. The light also works by sensors. A very practical feature of the Toto Washlet S350e is that it can keep your toilet clean each time you flush it because it produces electrolyzed water. The toilet will turn regular water into electrolyzed water – a disinfectant that many hotels and food preparation facilities use – to kill bacteria and viruses in your toilet bowl. Compared to other toilet seats, the Toto S350e has many spray settings for maximum comfort. You can also get it to store your personal preferences so it will remember your wash settings every time you use it. As you can tell, this is just a great bidet seat. It is the slimmest on the market and we can’t recommend it enough if you’re looking for a full-featured bidet seat. We go over the Toto Washlet s350e in more detail in our review here so if you’re considering this bidet, make sure you read our review! The next awesome bidet that we want to talk about is the Bio Bidet Bliss BB-2000. It is one of the nicest looking toilet seat bidets there is. It is sleek and will match very nicely with a modern bathroom. Like the Toto S350e, the BB-2000 has a night light. It is powered by a remote, and you can pick between a white or black remote. Though not as slim as the S350e, it is still a very slim toilet seat. There are a number of wash settings just like the S350e, and some features that will help you keep the toilet clean, such as a self-scrubbing nozzle. The BB-2000 heats water via a unique hybrid heating system. Normally, water is heated by either a water tank reservoir system or a heated coil. Each system has its advantages and limitations, but with the hybrid system, the BB-2000 toilet seat incorporates the best of both worlds. We don’t want to go into too much detail here, but we explain the heating system in our review, so make sure you read that if you are considering this bidet. The final bidet that deserves a spot on our list is the Brondell Swash 1000. Out of all three bidets on this list, we love the Brondell the most for its simplicity. There is a small learning curve. The remote is incredibly easy to use. It has nice large buttons that are easy to read and understand. 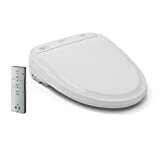 Although it doesn’t have fancy features like a night light or electrolyzed water sanitation, it is a compact toilet seat that cleans well, is well designed, simple, and comfortable to use. Check out our review here.